Thise modern villas in Fethiye for sale is built over 3 levels and is a bright and spacious villas with a gallery landing from the 2nd and 3rd floors overlooking the lounge and bedrooms overlooking the swimming pool. 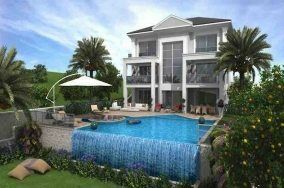 On the ground floor of these Sunset villas in Fethiye for sale you will find the open plan living area and a separate W/C. The kitchen is spacious with plenty of storage and worktop area. The large central window lights up the whole house with the patio windows leading you out onto the swimming pool and garden area. On the first and second floors you will find two suite bedrooms on each floor with wardrobe and storage areas alongside the en-suites. The is terraces from the first floor bedrooms overlooking the swimming pool. The swimming pool and garden area is laid out to complement the villa giving you plenty of sunbathing areas and also shaded area under the main pergola if required. The swimming pool can have walk in steps if required also. You have the option of Infinity or Roman style swimming pool depending on the plot location. If you are buying this villa off plan you have the option of adding all of your own features and colours in the tiling, kitchen and bathrooms etc.